Teen Choices A Program for Healthy, Nonviolent Relationships is a 3-session computer tailored intervention that includes questions, individualized feedback, videos, and personal stories designed to educate, motivate, and inspire students to use healthy relationship skills to improve their relationships and stay violence-free. Online sessions last 25-30 minutes. The program has separate intervention tracks for high-risk daters, low-risk daters, high-risk nondaters, and low-risk nondaters. While daters are encouraged to develop and use healthy relationship skills in their dating relationships, nondaters are encouraged to use those skills in peer relationships, as peer relationships provide a foundation for later romantic relationships. For students involved in an unhealthy or unsafe dating relationship, there is a fifth intervention track focusing on keeping oneself safe in relationships. 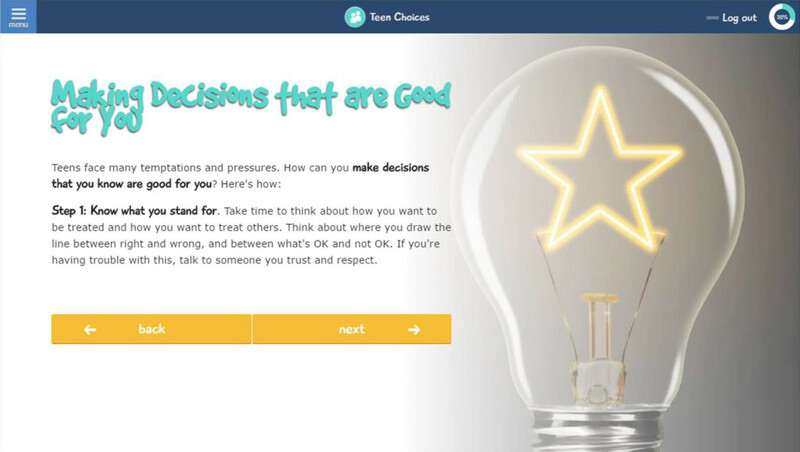 Levesque, D. A., Johnson, J. L., & Prochaska, J. M. Teen Choices, an online stage-based program for healthy, non-violent relationships: Development and feasibility trial. Journal of School Violence, (in press). Levesque, D. A., Johnson, J. L., Welch, C. A., Prochaska, J. M., & Paiva, A. L. Teen dating violence prevention: Cluster-randomized trial of Teen Choices, an online, stage-based program for healthy, non-violent relationships. Psychology of Violence, (in press).